By pressing the button New Text Object in the Top-menu of the graphics editor, you create a new object that contains text. To enter the text, you should open the item Elements and enter your text in the window Text (the symbols you enter will be displayed in the editing window). After entering, the object may be positioned in the editing window. You can change sizes of the window with text content, if you open the editing window and drag a black marker from the corner or from the middle of a rectangle’s side. In the field Nаme of the section Elements you can specify a name for every object, including text objects. The current position (XY) and sizes (WH) for a PIP object are displayed and may be edited in the field Position (countdown of coordinates is implemented from the left top corner of a picture). In the field Style you can set a type of text alignment in the window: the parameter H is responsible for horizontal alignment (flush left/right, or center), the parameter V is responsible for vertical alignment (aligning the upper/bottom edge, or center). The parameter Lsp defines the interval between the text lines, the parameter Csp defines the interval between symbols. In the field Font you can choose a font, size and type of font: Bold, Italic. The parameter Hinting allows users to choose a mode for changing the font outline while rasterization, for providing a clearer form of symbols when displaying small text. Important: for the correct displaying of text by the SL NEO server, the server and the network workstation that is responsible for text editing should contain identical font sets. 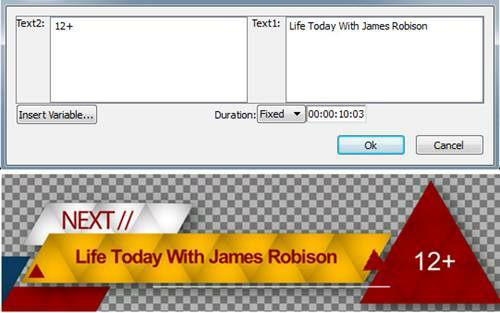 In the field Background you can set a color of text background and degree of its transparency. SL NEO platform graphic “engine” contains a mechanism that allows the user to bind the backing to the text object for automatic adjustment of its sizes and position to the sizes and current position of the text. The object that contains a backing should have the Rectangle type. This function is useful for parameterization of text from a playlist. To configure the tie-in, you should activate the item Linked Rect in the text object properties, then specify a name of an appropriate Rectangle object in the field Linked Rect (field Name, tab Elements). The fields Left/Right/Top/Bottom margin are used to define the values for increasing sizes of the backing relative to the text (for a definite number of pixels). Wipe is the Gradient Wipe effect that uses the full screen static picture, containing a transition template (Wipe). During the transition duration that is specified in the field Dur, the object transparency will being changed. Herewith, the sequence of changing the object transparency will be observed: from the darkest areas of a pattern, with a smooth transition to the lighter ones. The template example at the picture is a full screen wipe: when the object appears, the wipe will “open” it from left to right, and when the object disappears, the wipe will “close” it from right to left. You should import a static full screen file that contains a BW pattern to the server database, then add the pattern to the composition by pressing Add (section General, window Wipes): the template will be named as wipe_1. Then, open the section Elements and choose the PIP object: in the fields Mix In/Mix Out find the line Wipe and manually enter wipe_1. The mode Local Wipe scales the transition template to the current sizes of the PIP object. Using this mode is convenient for texts with small sizes: in this case, the full screen transition may not give the necessary visual effect. For viewing effects in the editing window you should activate the black button “X” in the editor Top-Menu. The field Key Points allows programming a simple 2D animation according to the key points. To set the first key point, use the scrolling bar (at the bottom part of Graphics Editor) and define the point that will start implementing an effect (you can also enter a temporal value to the field near the slider). After this you should specify the first point: press "+" at the editor top field. The temporal value that conforms the first key point will appear in the field Key Points – Time; the fields for editing the values will become active. Key Points are displayed for all objects of the composition in the field that is placed above the scrolling bar, at the editor bottom part. Smooth is a smooth change of moving speed. If the parameter is not set, the moving speed of an object from point to point will be linear; if the parameter is activated, the speed will be smoothly reduced when it's close to the point. Parameterization of text can be understood as passing data that contain text information, from external sources into a graphic composition. Using this technology creates general design of a program or a channel, meanwhile, the text data is loaded separately (for example, from the playlist fields). It allows creating graphics by replacing only text in patterns. At the same time, the on-air playlist is the only document that contains all information about the on-air events, marks of start for graphics and text information. If needed, you can quickly change the design by the simple change of the appropriate template (the source of design). Configuring the parameterization of text is implemented in the window Parametrization; choose the parameterization type in the field Type. The default value is Disabled (the function is turned off), the value External activates parametrization from a playlist; the value RSS makes possible parametrization from txt/xml files and RSS-resources. 3. Place the composition into the playlist, right click on the playlist line and choose Parameters: type the necessary text into the opened window. Text that parameterizes a composition is displayed in the field Title of a playlist, or in the list of secondary events. Up to four text lines may be displayed in the playlist line (you can control up to four parameterized text objects respectively). For displaying several text lines you should increase the height of playlist lines. You can implement this in the configuration menu of Air Manager - (File/Configure). Then open the item Look and Feel, find the field Cell height in the window Tables look and define the necessary value for regulating the height of a line. 3. Place the composition into the Time Line, right click on the clip and choose Set Parameters: type the necessary text into the opened window. You can download an example of a composition to the link. This composition will need a file with the dynamic backing that you can download to this link. You should import both files to the server database. Examples of text parameterization from txt-files are described in details in the F.A.Q. section “Receiving and displaying text from external sources”. One of the variants of using the parameterization technology is reading off data from a playlist column. Text information may be read off directly from playlist fields (columns Comment, GPI Value etc) and then it may be pasted into the displayed text. Right click on a line from the secondary events window and choose Parameters - find the field Text Area 0 in the opened window and write the necessary text. For example, you can write “Coming up Next“, leave the cursor after the word “Next”, then choose “Insert Variable”. 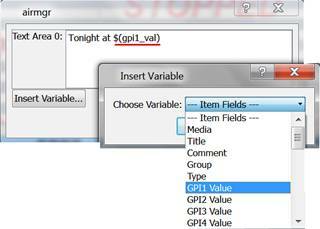 Choose a field (a playlist column) that should be read off from the list - in our example, it is GPI1 Value (GPI V1). The link $(gpi1_val) will be pasted into the text displayed in the editing window. During the event playback, the text $(gpi1_val) will be replaced by the content of the playlist column, from the field GPI1 Value (GPI V1 in the Broadcast window). By pressing the button “New Rss Text Feed Object” in the Top-Menu of the graphics editor, you create a new object that contains text. “Text Feed” is used for displaying RSS-information in tickers and SMS-chats. In addition to the basic parameters that set the properties of a standard “Text Object” (font, size, color etc), the element Text Feed has the parameters that set up the time for displaying a text message, intervals and pauses between messages. For adjusting the style of displayed text, you should enter any check text into the window Preview Text. Algorithms of configuring the text style, transitions and effects for the objects “Text Feed” and “Text Object” are completely identical. Spacing - the interval between messages, in pixels (actual for a ticker). You can view the composition with the results of parameterization in the window File Monitor. Algorithms of configuring the RSS-parameterization of text for the objects “Text Object” and “Text Feed” are completely identical. First, you should specify one or several sources of RSS-data for the composition. To do this, open the item General and find the field Data Feeds: enter the addresses of RSS-resources in the format http://server_ip:7901/rss/RSS_name, where RSS name is a name of a service that has been set in the SL NEO server control console while configuring the RSS server (for example, RSS_1). Disable means that parameterization is turned off, the server will display the text from the window Preview text. External is a type of text parameterization from the playlist lines. RSS is a mode of parameterization from an RSS-feed, you should choose this one. In the field Item: Selector: choose a type of message. Where Canada and Up are the clips in the server database with the images of the Canada flag and a green arrow, fg:#00FF00 is the parameter that sets the color of text placed after the tag, in RGB format. Like in HTML, the text color is set in HEX (hexadecimal) code numbers - #rrggbb, where r, g and b mean red, green and blue components respectively. You should set a HEX value from 00 to FF for every color - it conforms the range from 0 to 255 in decimal notation. Then all these values are united into one number that follows the symbol #. Variant #1 - viewing in the window File Monitor. Button -->, located in the field Local Monitor, sends the composition from the editor window to the window File Monitor, the button Play activates viewing. Variant #2 - viewing at one or several server outputs. The button + in the field Remote Server allows adding one or several server program channels to the list (or add the channels of several servers) to organize viewing. In the dialogue window: specify the server IP-address in the field Address, set the number of a program channel (Program_Channel) in the field Program and the layer number in the field Layer. The channels configured for viewing will be displayed as a list in the tab General. The buttons -->, located in the fields Layer_, send the composition from the editor window to the selected layer of an appropriate program channel of the server, the buttons Play activate viewing.